Executioner's Gloves is a Hunter Tool. "One of the secret treasures hidden in Cainhurst." "The gloves of an executioner from a faraway land." "Passed from executioner father to executioner son, these gloves can be used to summon wrathful spirits of the past by smearing them with blood." "It is said that the nobles found immeasurable delight in the dances of these vengeful specters." This hunter tool summons vengeful spirits in the form of 3 homing skulls that deal arcane damage to their target(s). Found in a secret location within the library of Cainhurst Castle. Go up the stairs and find a window that is open, walk through it carefully then navigate down to the bottom. From there, enter into a doorway that leads to a room filled with ghosts (Bound Widow) and immediately go to the far right of the room. The Executioner's Gloves will be inside a chest. Martyr Logarius uses various forms of this hunter tool's spell. Quicksilver Bullet usage can be heavily compensated with blood bullets for continuous casting. This hunter tool is effective against opponents who are vulnerable to arcane damage. It can also be useful against fast opponents due to the spell's homing capability. The massive scaling with arcane means it's worth putting at least 50 points towards the stat to maximize damage. It's capable of staggering opponents, mostly human/humanoid sized, including bosses like Orphan of Kos. The red glow is the same as the Logarius' Wheel. Presumably, the "wrathful spirits from the past" it summons are the spirits of Vilebloods that previous Executioners have killed, given the description on the Wheel. Since the Executioner's Gloves are said to have come from a far away land, it's possible that the Executioners have slaughtered more than just Vilebloods (essentially anyone they considered heretics). In this case, the spirits would also be from those victims as well as the slain Vilebloods. Given the item description it is more likely that the executioner gloves are not connected with the Healing Church Executioners, and are instead a Cainhurst item. The descriptions tells us that the nobles delighted in the dancing spirits, making it more likley that the gloves belonged to a hired executioner of Cainhurst, and that the spirits were those put to death by the nobles. To me this is a homing shotgun. It is relatively inexpensive so I will share my favorite method of using it. See a tough enemy? Up D-pad for extra bullets and heal up. Shoot two blasts of this and you have dealt an easy 1k+ damage from range for the cost of one vial and one qs bullet. Works well with hunter enemies that rush the dodge and get hit by all three skulls, as well as large enemies like the amygdala (I use it after the buff and before the final phase for an easy visceral). Only downside is that it spreads early and hits walls in close quarters. It might even go over enemies&apos; heads at lauch if they are two close. For this cases I use the tiny tonitrius. This is the wrong image. That&apos;s the glove piece of the executioner&apos;s armor set, not the hunter tool. Anyone else feel this is a connection to the Dark Souls universe? 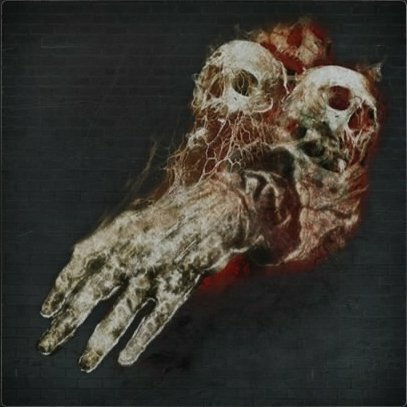 Considering that the red skulls of the glove are the same effect used by Slave Knight Gael, and Gael himself is hinted to have been an executioner (his sword is a broken executioner&apos;s sword). Seems like this is the best hunter tool, it&apos;s the only one I find myself using consistently, especially with a 99 arcane build. Nothing really compares IMO. Just get remotely close and lock on. At 40 arcane, these things do massive damage. They have great range and chase enemies as they run in fear from your easy mode. do the gloves act like homing soulmass from the souls games as in the higher you arcane the more projectiles or is it just 3 always? There are those days when a 50 point arcane user simply wants to go full wizard against some unsuspecting fool. This hunter tool exists for that exact purpose.Didn&apos;t need a whole lot of changes, but I managed to clean the page up a bit. I think these do blood damage. It knocked back one of those blue spiders, like when you shoot it or hit it with the chikage. I&apos;ll have to see if it knocks down dogs and chevaliers too.